It's just one month to go before we all cast our votes at the ballot box to chose a new Mayor for London. Cycling has seen explosive growth over the past four years and with it an increasing awareness of how much needs to be done to keep everyone safe on our roads - getting about on two wheels is shaping up to become a deciding issue of the forthcoming election. Over at London Cycling Campaign they are busy preparing for The Big Ride - the culmination of their Go Dutch! 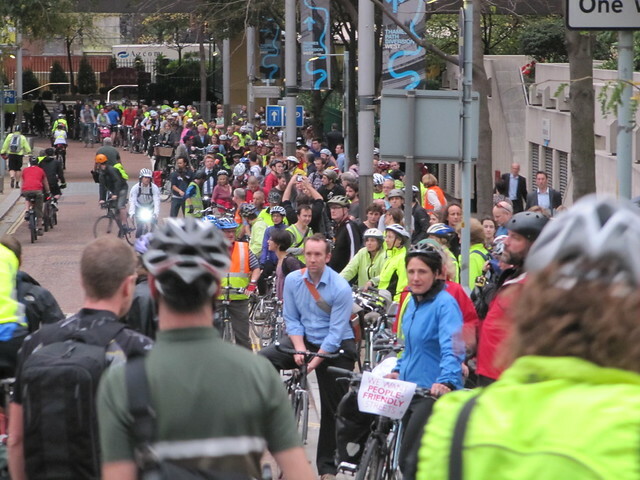 campaign which calls for clear and safe space for cycling on London's main roads. Chosen overwhelmingly by LCC's members the campaign has really caught the imagination of the wider London public - in just a few short weeks nearly 20,000 people have already signed their petition calling for the next Mayor of London to make our roads as safe for cycling as they are in the Netherlands. All of the protest rides, vigils and actions which have taken place in London over the past year have been leading up to The Big Ride - from the Battle for Blackfriars Bridge, to the Tour du Danger of London's most dangerous junctions for cyclists. At the Christmas Vigil where we remembered the 16 cyclists killed on London's roads in 2011 to the Pedal on Parliament where 2000 daring souls braved the wet and windy elements to have their voices heard on the eve of the national CycleSafe debate - each of these powerful and compelling protests have been dry runs for The Big Ride. Taking place on a closed road circuit from Park Lane to Blackfriars Bridge on Saturday 28th April, the family-friendly carnival-style ride may lack the anarchic punch of Bikes Alive or the haunting immediacy of the installation of a Ghost Bike but it will show very real Londoners - very real voters - of all backgrounds and of all political persuasions and none telling the Mayoral candidates that we must have safer streets for cycling. Feeder rides from across the city will converge on the start point meaning it is safe and easy to get there, and the ride will take place just a few days before the election itself meaning this will surely be the biggest event during the entire Mayoral race. And the sense that cycling's moment has really come and that our politicians really must start to enact change is not just contained to London. Leicester has just held its largest ever Critical Mass celebrating cyclists of all shapes and sizes, whilst up in Scotland they are getting ready for their own Pedal On (the Scottish) Parliament to call for safer streets there. Whilst the Dutch celebrate Queen's Day on April 28th, we'll be taking inspiration from their Stop der Kindermort campaigns of the 1970s and taking to the streets ourselves. And all this takes place under the watchful, influential eye of The Times newspaper and their ongoing Cities Fit For Cycling campaign. Meanwhile, a new campaigning group - Londoners On Bikes - is seeking to turn all of this groundswell of support for safer cycling in to actual votes. They know that the one thing that the Mayor of London really controls is Transport and that it is in their power to truly create safe conditions for mass cycling. Londoners On Bikes are asking people to sign up to pledge to "Vote Bike" on May 3rd. The election will determine what course cycle safety will take for the next 4 years, and Londoners On Bikes will make a recommendation to all of its members who to vote for based on each candidate's declared aims and policies for improving cycle safety. The more people who sign up, the more the candidates are offering. With enough people pledging to "Vote Bike" and to use their vote purely on this single issue LOB are creating a "bidding war" between the candidates with more and better safer cycling actions being pledged. In an election as tight as the race between Boris and Ken the cycling vote could swing the election. The next four weeks will be a fascinating time in the world of cycle campaigning. Add April 28th to your diary for the London Cycling Campaign Big Ride. Bring your friends, bring your family, bring your neighbours - this will be the biggest family-friendly ride in central London this year and an amazing opportunity to see the sites whilst telling the future Mayor of London you want safer streets for cyclists. With feeder rides from across London you've no excuse not to! Nearly 20,000 people have done so already - can we reach 30,000 by May3rd? Share the link on your Facebook, tweet it to your friends. Download a petition form and take it to your school or church group. Let's make sure that cycle safety is the one issue the future Mayor can't ignore, so sign now! Sign up to Londoners on Bikes! Are you prepared to vote with your bike? The more people who pledge to do so, the bigger the number of votes on offer in a very tightly run race, the bigger chip cycle campaigners have to barter with. We all feel strongly about employment, the health service and crime but transport is the one thing that the Mayor REALLY has influence on, so sign up today! Chief Exec of the London Cycling Campaign presents the Go Dutch campaign - LCC's biggest and most popular campaign to date - at Street Talks tonight at the Yorkshire Grey. See the Movement for Liveable London website for details. Living Streets have gathered all of the Mayoral candidates and their representatives together for a transport hustings on Thursday 5th April. Go along and hear what each of our potential future Mayors has to say for themselves in person - register here for tickets. All the very best. A lot of people around the world are watching. It would be so good to use London as an example of what happens when you make a city safe for cycling.